Land Rover has joined the pack of automakers who know that dogs are an effective way to connect with consumers. The luxury automaker put its toe in the water with elegant Rover’s Lounge installations at the Kentucky Three-Day, a huge equestrian event it took over the title sponsorship of this year. Two of the comfort stations were strategically positioned on the grounds at the Kentucky Horse Park with water bowls and a comfy cushioned bench for owners. A Land Rover representative was on hand at each station to greet pet owners and offer them a branded dog-bone shaped zippered pouch that included a Land Rover leash and a roll of the always-needed dog waste pickup waste bags. The automaker also had Land Rover-branded dog bones. Finally, the representative offered to take their picture with their pet at the station. 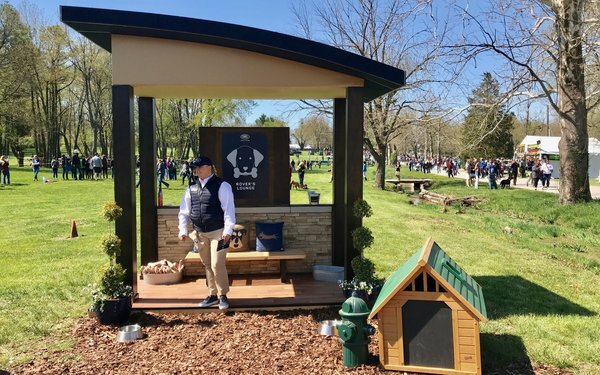 Land Rover Marketing Vice President Kim McCullough told MediaPost she came up with the idea during a previous Three-Day when she saw so many dogs with attendees who were clearly in need of water on the hot Kentucky spring day. “It was just a matter of seeing a need and finding a way that we can fill it,” says McCullough, a dog owner (and lover) herself. Nissan and Subaru also have dog-related initiatives. Nissan continues to display its Rogue Dogue SUV at auto shows. First introduced at the New York auto show in 2017, the vehicle comes with a custom dog bed for the rear cargo area in addition to a slide-away ramp for getting in and out of the high-sitting SUV. The Dogue also has air vents for the rear compartment, as well built-in dispensers for food and water. If that’s not enough, it also has a 360-degree dogshower with a 10-gallon water tank, as well as an integrated dog drying system with a compressed heated air dryer. Finally, there’s a hammock located in the second row of the Rogue Dogue. More than 75% of dog owners surveyed by Nissan said that having optional features specifically designed for their dog’s safety and comfort would impact their decision on which vehicle to purchase, said Michael Bunce, vice president of product planning for Nissan North America. Subaru of America has long been a leader in the dog-vehicle arena. The automaker even has a series of commercials starring an adorable Golden Retriever family, The Barkleys. At last year’s Los Angeles auto show, the automaker topped itself by having the dogs “drive” the new Subaru Ascent out on to the stage for the most adorable vehicle reveal ever. With road trip season right around the corner, Subaru is currently offering preventative tips to ensure pet safety in SUVs on behalf of the Center for Pet Safety. In a typical SUV crash, a pet who is not properly secured will become projectile, resulting in death or serious injury – Subaru of America and the Center for Pet Safety (CPS) have teamed up to identify the safest spots in a SUVs for your furry friends. With trucks and SUVs accounting 63% of new-vehicle sales this year, it’s no surprise that budding families are looking for 3-row vehicles to ensure the whole family –including pets – can come along for adventure this summer. However, for the more than half of American pet owners that travel with their pets, it is crucial to understand proper safety measures for furry friends, based on the unique design of these SUVs. This partnership builds upon shocking findings of Subaru and CPS’s 2015 Crate and Carrier Crashworthiness Studies that revealed many of our pets are at risk when traveling, and their Pet Travel Seat Pilot Study, revealing that commonly available pet travel seats do not provide adequate protection in the event of a crash and are putting our beloved pets in danger. As larger, three-row SUVs have become more prominent in the market, Subaru and CPS analyzed the design and spacing in these larger vehicles and have identified the safest, and most dangerous, places for pets to travel based on the unique design of three-row SUVs. To ensure safety for all travelers in a three-row SUV with captain’s chairs, pets should ideally be secured in the second or third row. Pets 20 lb. or less can be harnessed or secured in carriers in the second-row captain’s chair. Larger pets, more than 20 lbs., should be properly secured and travel in the third-row bench directly behind one of the captain’s chairs. Owners should never place pets on the floor between the captain’s chairs in three-row SUV models, as this could result in the pet becoming a projectile and cause serious injury to both the pet and vehicle passengers. When traveling with both children and pets in a 3-row vehicle with captain’s chairs, secure the child in the second row and secure the pet in the third row, on the opposite side of the vehicle as the child. There’s nothing more quintessential to summer than seeing a dog’s head hanging out a car window, but these simple safety tips should be heeded to help prevent tragedies. 1 comment about "Land Rover, Nissan, Subaru Connect With Owners Via Dogs". craig kleber from TLC, May 9, 2018 at 3:57 a.m. This is not the first time Land Rover partnered with dogs to make a bigger brand connection/statement and generate potential sales leads. In the later 2000s we (Y&R) partnered Land Rover dealers in the DC area and HSUS (I was a markting advisor to the HSUS and knew theior CEO personally - as well as a dog rescuer and adopter) to help launch the LR2. We had similar syndicated research insights as the article states. The idea was to host spay/neuter and adoption events using the dealer car lots as well as feature LR2. LR2 was aimed at a more urban, younger and single, higher socio-economic person and dog adoption was higher amongst that group. It created a brand AND brand shared halo where the audiences would get positive feelings and maybe more (for Land Rover and the four legged rovers). Besides brand exposure what was so interesting about this idea was Land Rover being an active participant in "doing good" and being a friend to dogs and their owners.